We counted 20 Black and Brown beauties who shined in stunning fashion at this year's show! Which look was your favorite? Okay sis, before you start frowning your face up at the thought of yet another white-washed Victoria’s Secret fashion show, we’ve got news for you—this year, there were actually 20 Black models who stormed the show and got their angel wings! We know, we know; having Black models in a show shouldn’t even be a debate or an afterthought—especially not in 2018—but because of fashion pioneers like Bethann Hardison, Naomi Campbell and others, the roadway has been paved for new beauties like Chey Maya and Iesha Hodges to strut their stuff for one of the biggest fashion show productions on earth. We counted 20 Black models in total who were on hand to strut their stuff for the show, but the melanin magic didn’t just stop with models! Take a look at all the stunning women of color who ripped the runway in our photo gallery below. The 2018 Victoria’s Secret Fashion Show airs Sunday, December 2nd on ABC. Mayowa Nicholas is stunning in yellow! Subah Koj was a vision! Jourdana Phillips werked her cute choker! Alanna Arrington's golden moment WAS a moment! Yasmin Wijnaldum gave high-fashion glam in this dress! Chey Maya's excitement was our entire mood! Lais Ribeiro gave us goddess vibes! Jasmine Tookes became the angel of the night! Duckie Thot is a slay-and-a-half with her melanin magic! Melie Tiacoh was all smiles! Leomie Anderson stunned in this bejeweled number! Winnie Harlow put the icing on the angel-winged VS cake! Lameka Fox stood proud on the VS runway! Herieth Paul was a strutting beauty in the show! Grace Bol was a work of art! Zury Tibby gave us life with her VS shades! Aiden Curtiss is all the feels in her floral crop-jacket! Cindy Bruna was as bright as a star! Isilda Moreira's fun spirit was infectious! Iesha Hodges gave us some serious blonde envy with her hair! Halsey slayed in her feathered skirt and feathered eyebrows! 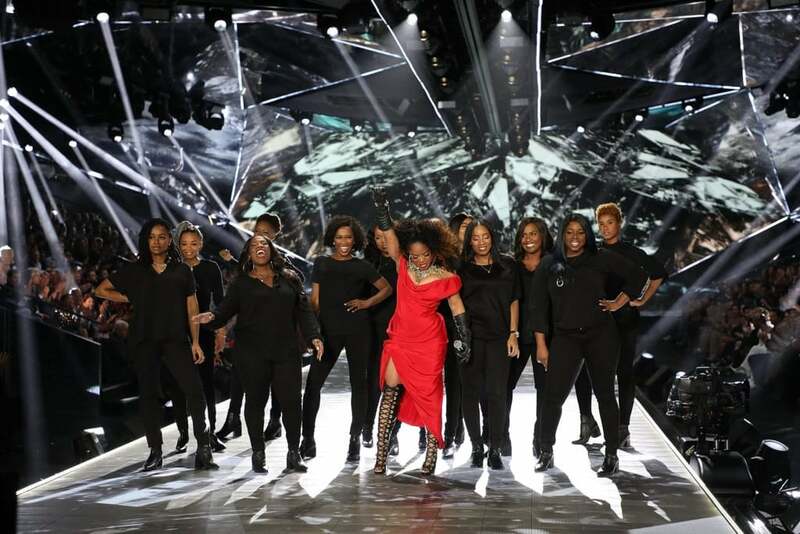 Leela James and her female choir brought the house down!